The Vogtland Philharmonic 10 years ago issued a release of film music called Hollywood Sounds featuring many of the new releases in simple but effective arrangements. The one hour CD, probably played in one of their numerous concerts offers a variety of material which helps to break up the CD. Going from the entertaining James Bond material to the funny Flintstone theme, which brought back memories to me when it was on prime time television, to the serious Harry Potter and the Goblet of Fire, an action score. My favorite of the group is the main theme from The Terminal (Viktor’s Theme) The use of the clarinet perfectly fits the behavior of Viktor who is trapped in the airport unable to enter the United States. One of Hanks better efforts in my opinion. Also included are the standards Lord of the Rings, Star Wars, Pirates of the Caribbean, Schindler’s List. Included is a James Bond compilation which I found very weak as well as a poor rendition of Forrest Gump. I found the 9 minute version of King Kong to be be a pleasant listening experience. As part of the three volume set this starats the ball rolling and subsequent volumes (especially three) make this an exciting package. As a listener I’m quite surprised that I was unaware of this series given th fact I easily have over 2000 CD’s in my collection. The surround quality is far superior to the convential CD system with it’s stereo quality opposed to the 5 speaker system. A major complaint that I had about this disk was the published track listing. It was completely wrong and I found I needed to listen to the tracks and put them in the proper order. If you do purchase the disk my track listings in my review are correct. Sounds of Hollywood vol. 2 offers another varied selection of mater although I do take exception to the arrangements such as Ben Hur which lacked the emotion necessary to such a powerful score, perhaps the best work that Rozsa ever did. The orchestra seemed to go through the motions and the result is quite evident. On the other hand one of the real treats of this CD is the playing of the John Williams Tango. The violin is superb, the tempo nicely done. One can close your eyes and see two performers dancing the night away. I’ll give a passing mark to The Pink Panther theme although if you listen to the Boston Pops version with John Williams conducting you’ll find it a lot jazzier and a much stronger sax solo. When I was studying music (arrangements) in college I orchestrated this piece and it came out fine. Light and airy describes the Leroy Anderson tune The Typewriter and is a fun piece to listen to although I miss the use of an actual typewriter which was used in the original. Gabriel’s Oboe a tur Oscar winner for Morricone that never happened is again on the weak side when one compares it to the original soundtrack. The Dark Knight version of the Hans Zimmer composition to the film is a strong 7 minute version filled with all the emotions you’d expect to hear. We canput this one in the plus column. As was the case with volume one of the sounds of hollywood volume 2 adheres to the wrong track listing. The one I provided in my review is correct. Pehaps we’ll see in the future a three volume set of these recordings at a special price. The CD starts out with the main theme from “The Greatest Show on Earth ,” a circus march that would have made Sousa and Barnum proud. This is a tune to be played by marching bands in parades and sporting events. “The Uninvited (1944),” a tale of a ghost and dark mansions gives Young ample opportunity to write underscore that is both playful and dark. 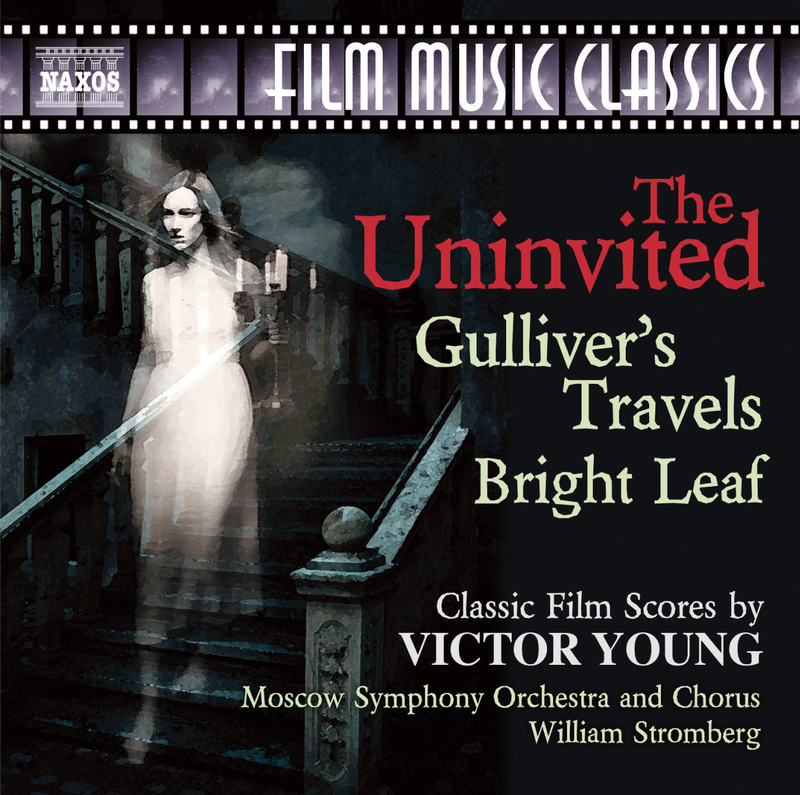 Blended into the score is the wonderful Stella by Starlight theme which is nicely woven into the tracks by John Morgan and nicely performed by William Stromberg conducting the Moscow Symphony Orchestra. A short but wonderful track is The Village which takes you to Ireland for a brief but enchanting track. Another good underscore track is The Sobbing Ghost which is playful but also eerie and ends on a bright note with the Stella theme. The 24 minutes pass by very quickly. “Gullivers Travels (1939),” also reconstructed by John Morgan was not a success at the box office but what does that have to do with score. Young came up with a fine offering of sentimental, melodramatic, and cartoon like music all with the trademark sound he did 300 times. The Prelude and the Storm offers stirring storm music, the main theme, and a bit of comic relief. The brass have a section where they earn their money with a bit of complicated playing. “Bright Leaf (1952),” a film Young did for Warner Brothers about a tobacco farm starring Gary Cooper. As is the case with most scores Victor Young offers us a bright major key theme which is followed by a second theme written in harmony to the first one in Prelude-Welcome to Kingsmont. The six minute track also has a danger cue and a bit of frivolity, an excellent track. Sonia is yet a third theme that is light and delicate, a fine example of a theme for the lovely Lauren Bacall. Machine Montage is exactly what you think it might be depicting machines in machine sometimes at a frantic pace and mixed in with the main theme.Margaret is another sweet sentimental love about the character in the film who is cast aside for Sonia. Tobacco Montage is similiar to the machine track except there is quite a display of brass. Southern Vengeance has all sorts of things happening in the final six minute track.The Fie begins with strains of desperation and display. The Finale recaptures the memorable music that you heard in the beginning of the film. The sound which was once special is little more than adequate today as digital quality has taken a leap forward. With the cost today of soundtracks this one coming in at $8.99 is quite a bargain. This release is identical to the Marco Polo #8.225063 which was released in 1998. 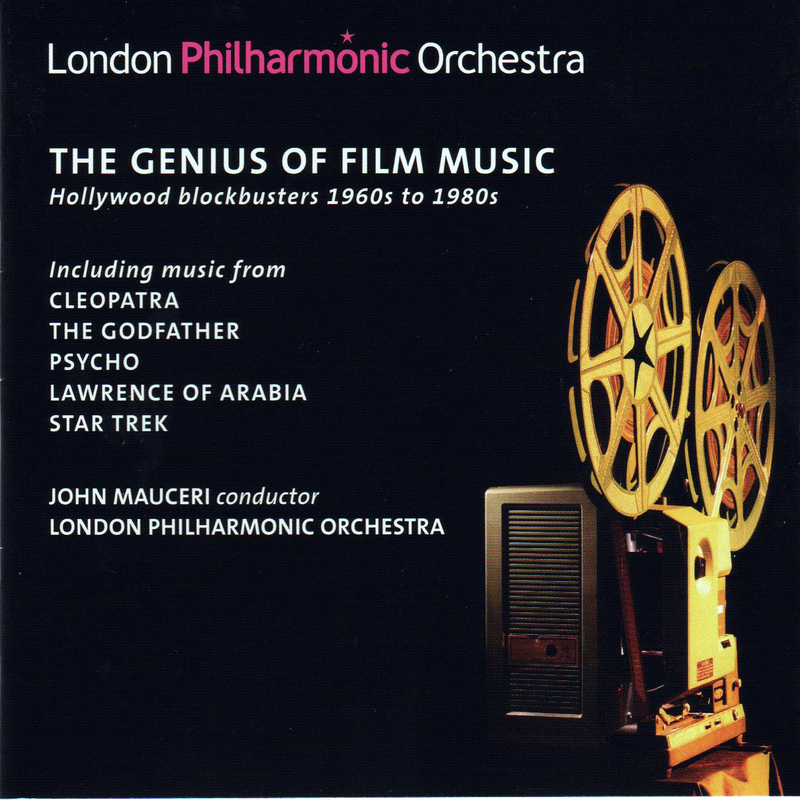 Did you realize that the London Philharmonic has recorded over 25 film music albums? I for one was quite surprised as I always considered it to be the orchestra that Sir Adrian Boult conducted because one of my very first albums purchased was a recording of Tchaikovsky’s HAMLET FANTASY OVERTURE, a recording I still own today although I must admit that I’ve worn it out and I have replaced it with many other recordings of this fine work. There are many compilation releases of movie music released every year in different forms but this release has the advantage of having John Mauceri re-arrange/orchestrate the material so you’ll hear it like you’ve never experienced before. Anna North, widow of Alex North, commissioned John to do a suite of material from the film Cleopatra( 1963)and the result is a spectacular 25 minute work that captures the music in a way you’ve never heard before and is the highlight of this 2 CD set released on the London Philharmonic’s label. It is delicate, romantic, majestic, brash, and dissonant all part of the package. It has a sound of the ancient as well as modern jazz. This suite alone is worth the price of the CD’s but there is more a lot more. The Godfather, a symphonic portrait, was also given the Mauceri touch and plays out like an operatic overture. It comes complete with romance, samba, early 20th century jazz, and excellent orchestrations. The 15 minute suite plays out quite nicely. Completing the first CD is the famous “The Ride of the Cossacks” from Taras Bulba,” a tune that Waxman found in a book of historic Russian folk sounds. It plays out like the style of Ravel’s Bolero, becoming quite frantic by the end. Both Shostakovich and Waxman had used this previously in other works each teasingly saying they stole the idea. Bronislaw Kaper wrote one of his last scores Mutiny on the Bounty (1962) and it is nicely presented here in a 12 minute suite that not only features the love song, Oscar nominated along with the score, but all of the exotic material that he wrote for the Marlon Brando film. Kaper like Waxman and Korngold escaped to America and found a new home in Hollywood where they contributed unforgettable material. It is presented in a way that I had never heard before, again playing out more like a symphonic suite. Similar things can also be said of Psycho, a narrative for string orchestra, which Herrmann composed and recorded in 1968 while living in London. Norma Herrmann was kind enough to share this wealth of material with Mauceri who created a performing edition. Written somewhat like Stravinsky’s Rite of Spring in short cell like melodies they performed a pattern that the moviegoer has never quite heard before. Rounding out the CD’s are themes from Star Trek, Once Upon A Time in America, and Lawrence of Arabia. The 90 minutes goes by rather quickly as the sound quality and mixing enhance the superior playing of the London Philharmonic even more. I put this release in the classical category as the tracks are wonderful duets of a husband and wife team on violin (Hedman) and piano (Redfeld) as well as three selections featuring clarinet (Foster) and trumpet (Washburn) also with Redfeld on the piano. John Williams music translates very nicely into this chamber music style, something that can’t be said of other composers. I certainly applaud BSX for continuing this unofficial series of young composers in a most intimate setting. In my opinion I feel that the listener is being exposed to chamber music and it will encourage them to seek out additional material. 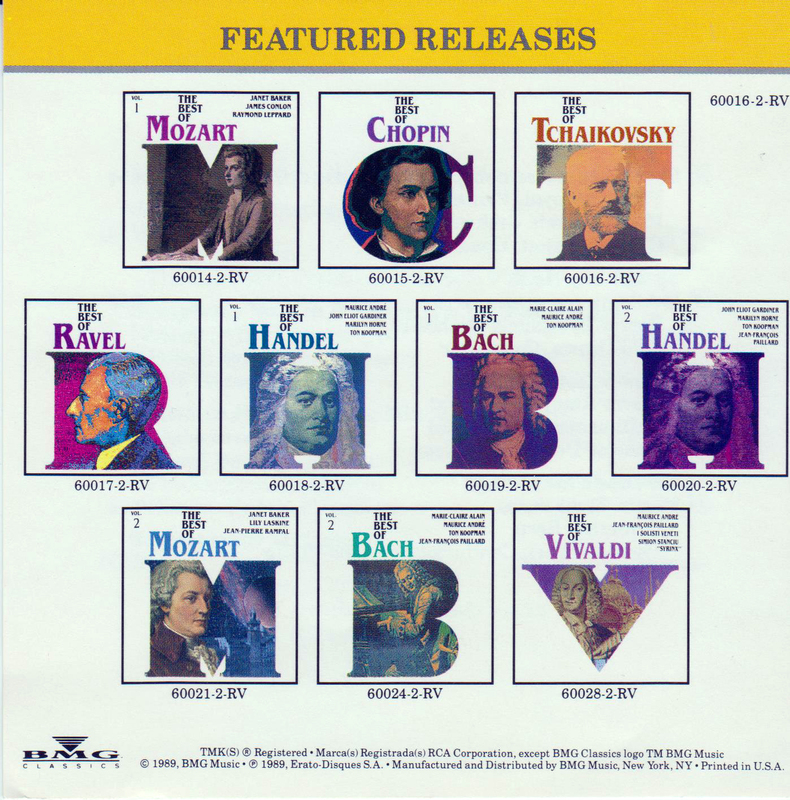 On this particular CD some of the selections are arranged by Williams, others by Redfeld, and some are Williams arrangements that have been modified by Redfeld. 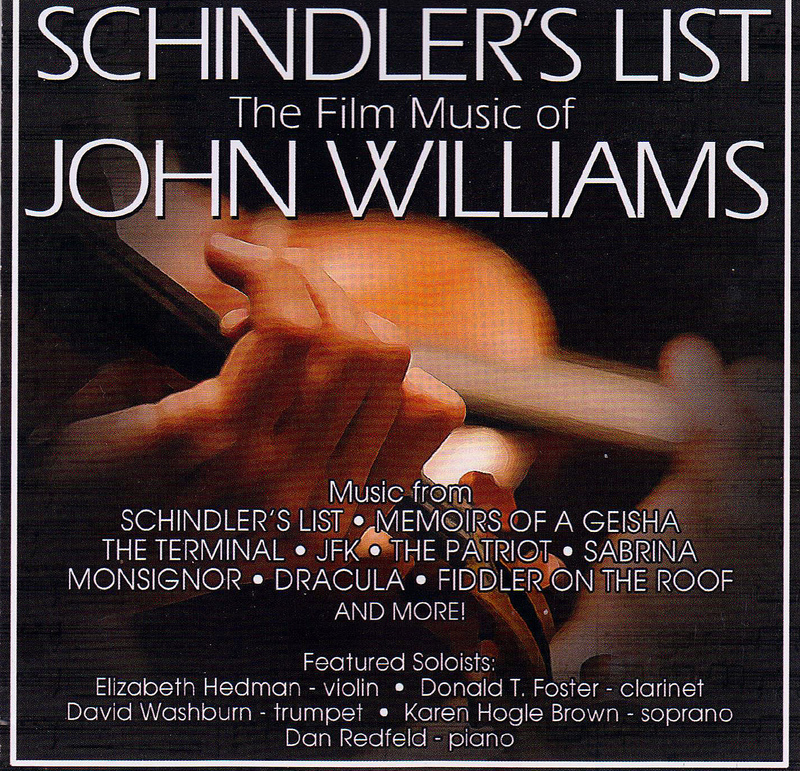 There isn’t a nicer way to listen to Schindler’s List than in a duet with piano and violin of not only the main title from the film but also the tracks “Jewish Town” and “Remembrances.” This arrangement comes from John Williams and is performed by Hedman and Redfield. The violin offers the melody (voice) and the piano the harmony making for an effective arrangement). A very pleasant way to listen to fifteen minutes of Schindler’s List. In The Terminal: “Viktor’s Tale” Donald Foster, clarinetist of John Williams, is featured in a reprise of his solo in the film. Talk about a catchy theme this is one that you’ll remember once you’ve heard it. Again in this arrangement the clarinet provides the melody (voice) and the harmony comes from the piano. Monsignor’s “Main Theme” features the fine trumpet of David Washburn in a track where the melody is shared with the piano as each offer harmony. This is also true of the “Main Theme” from JFK. Both of the trumpet solos are of the proud and majestic type, what you might expect from a trumpet. One of my favorites on the CD is “End Credit” from Dracula. Both share the melody in one of the better Gothic romantic themes ever. This reviewer thinks of a raucous fast paced arrangement of Fiddler on the Roof but to my surprise it is somewhat refrained and very nice to listen to. I can find no fault at all with any aspect of this recording except for a bit of a couple of the digital images beginning to break up. The sound recording and mastering, liner notes, and selection of material are all top notch. This would be a nice selection to your collection. Give BSX a gold star for continuing on this fine series. Recommended. 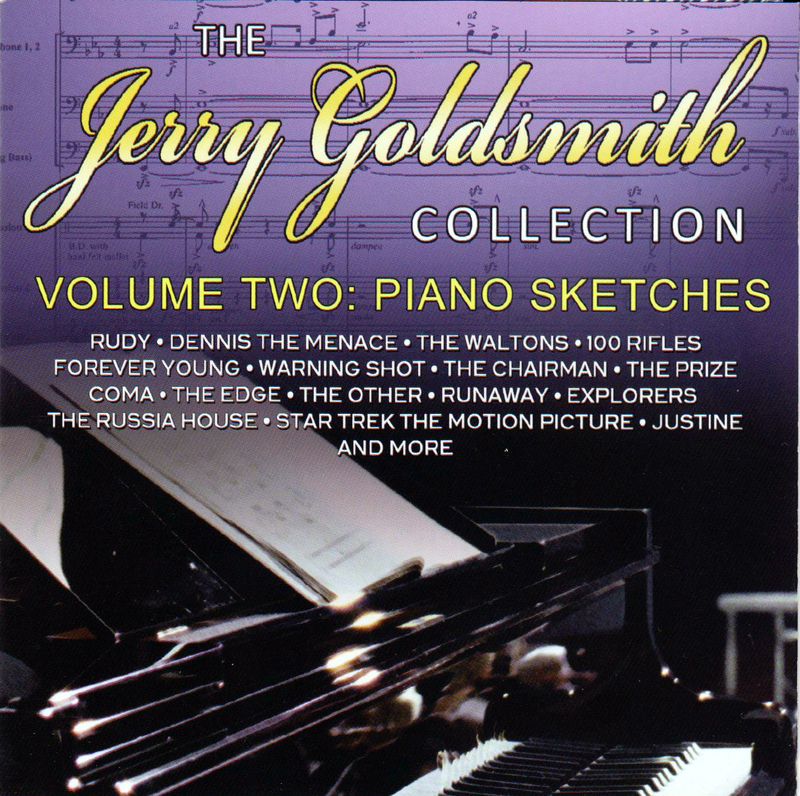 As a sequel to https://sdtom.wordpress.com/2012/06/15/jerry-goldsmith-collection-rarities-vol-1compilation/ without Dominik Hauser but with the addition of Dan Redfeld to the talents of Northam and Park, the trio individually performs 21 songs of a man who like Gershwin was never without creating a new melody, Jerry Goldsmith. In a 40 year span from 1960-1990 he was the dominant force of Hollywood soundtracks producing 71 scores in the 70’s alone. This compilation spans a 30 year period from 1963-1993 offering something from all of the different genres Goldsmith wrote for. The three soloists chosen for this BSX project are as diversified as the subject material and multiple listens to this CD will reveal the style of each pianist. A good example of this is the main theme to “100 Rifles” which is treated in the style of an etude de concert. Joolyun Park is delicate and forceful with an arrangement of some degree of difficulty. You wouldn’t know that this melody came from a western! The arrangement that Northam chose for the theme Free As The Wind from Papillon again hardly sounds like it belongs in a film only lacks a tinkling of glasses in the background to make it complete. The love theme from “Coma” rather than approached with softer touches is approached by Redfeld with strong powerful strokes in parts. Free as the Wind from “Papillon” is arranged in such a fashion that you’ll scarcely recognize the theme from the complex arrangement created by Northam without overdubbing. A well done quite classical interpretation. “The Sand Pebbles,” one of my favorite love themes from Goldsmith is created in a simple rather laid back fashion again by Northam. Who wouldn’t like “Rudy” treated in grand fashion by Redfeld who uses chords to make his point that this is a must have for Goldsmith fans and people who just like nice easy to listen to music. Even the “Walton’s Theme” which I associated with a sappy corny television series seems to flow rather easily in my audio canals. While I can’t classify this as a soundtrack recording I can say that this is one a soundtrack listener will enjoy. It is a different way to listen to some of the themes that Goldsmith created. If you’re with a non soundtrack listener you can be the star by being able to tell what movie these were written for as well as having nice background music. Who knows that the theme might not inspire someone to purchase the entire soundtrack. The sound quality produced a nice smooth listening experience for me through my Intersound speakers. Now more than ever before seems to be a good time to pick up bargains galore of used CD’s in thrift stores, pawnshops, and places that specialize in used audio material. Let’s face the facts and realize that this media form is going to go away and sooner than we might think. In my travels I found many CD’s for under a dollar and while I have many of Tchaikovsky’s works in my collection like a true collector this one caught my eye and I couldn’t resist. I’ve picked up several others and these will also be featured with their own review in the coming months. RCA/Victrola was introduced in the early 1960’s as a way of reissuing material from their RCA/Red Seal catalog at a much lower price. 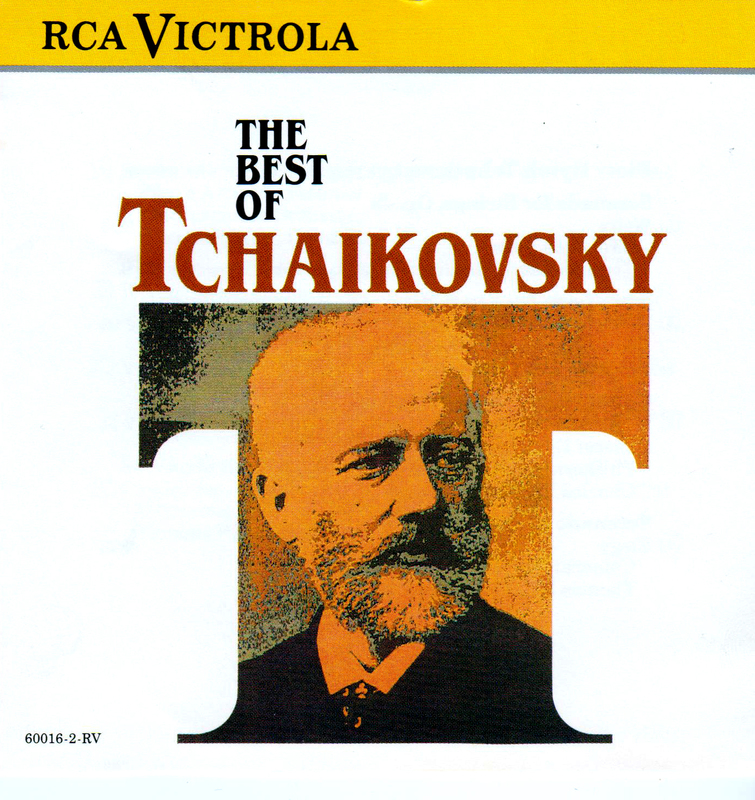 Part of the releases were a series of 10 “BEST OF” and the Tchaikovsky CD was one of them. The overall selection process seems to be awry from what I would have chosen as “BEST OF” from this talented composer. Missing are “Romeo and Juliet,” “Overture of 1812,” “Marche Slave,” “Violin Concerto,” “Nutcracker Suite” and “Swan Lake” among others. Instead the featured work is “Serenade for Strings” with three selections ( the waltz is featured in an audio clip) followed by two selections from his “Symphony No. 6.” I realize that some of my other favorites shouldn’t be included in releases such as the one that is being reviewed but I would have chosen differently and it would have been a lot more varied and interesting for the listener. The overall quality of the recording is fine as the selections are divided between three orchestras and two soloists and the actual mastering is up to the usual RCA/Erato standards. If you’re fortunate enough to find this one for a dollar like I did and you’re interested in classical music I certainly wouldn’t hesitate getting this. Look for more of my bargains in the future.